CBS Newspath deploys LiveU Matrix. Hackensack, NJ, April, 2019: LiveU and CBS Newspath have reached an agreement on a multi-year deal for LiveU Matrix to handle contribution and delivery of live content to its 200+ affiliates and seven global news bureaus. 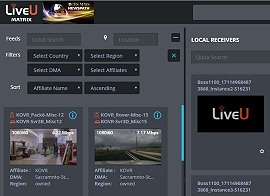 LiveU Matrix is a highly efficient content curation service that empowers newsroom managers to quickly and easily give hundreds of affiliates unparalleled access to live feeds from LiveU units in the field and other sources without any interruption, additional resources, or expensive fees. “The change to LiveU Matrix is instrumental to our strategy of reducing our reliance on satellite and fiber technology, while affording us increased flexibility in our newsgathering and content sharing,” said Tim Gaughan, CBS News Vice President of News Services. “LiveU Matrix also complements CBS Newspath’s current use of LiveU HEVC acquisition technology, giving them a complete, end-to-end HEVC solution that delivers exceptional quality, reduces bandwidth requirements and is managed through one simple interface,” said Avi Cohen, LiveU COO & Co-founder. “HEVC was a prerequisite for this deployment. LiveU offered a one-stop-shop for hardware-based HEVC field encoding and IP video cloud management to distribute high-quality live feeds to our teams,” added Tom Fearing, CBS Newspath Director of Technical Operations. Matrix, a dynamic cloud platform, makes it simple to curate content through one interface. Users can easily search, filter, preview, and distribute live feeds.